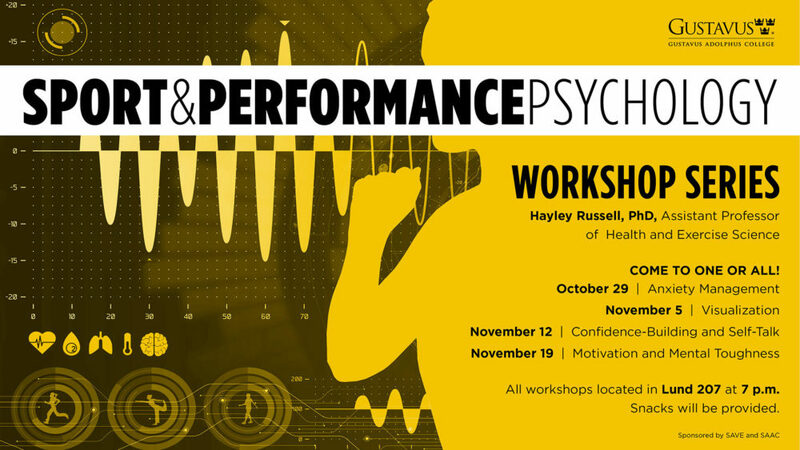 Dr. Hayley Russell will lead students in a four-workshop series addressing sports and performance psychology. An upcoming workshop series at Gustavus Adolphus College seeks to address the shaky hands and second-guessing that sometimes come before a big performance, whether it’s a sporting event, a class presentation, or playing a saxophone solo in the band. Gustavus health and exercise science professor Hayley Russell will lead the Sport and Performance Psychology Workshop Series on Monday nights at 7 p.m. in Lund Center 207 for the next month. The sessions, open to students and members of the Gustavus community, will focus on the importance of mental performance in sports and the arts and work to help students develop basic skills to improve performance. “This workshop is designed to help students focus on the mental skills needed to be successful when performing at a high level,” said Assistant Athletics Director Kari Eckheart. The series has sessions that focus on anxiety management, visualization, confidence building and self-talk, and motivation and mental toughness. The topics are geared towards student athletes, musicians, theatre and dance performers, or those who struggle with issues such as public speaking. Russell, who holds a doctorate from the University of Minnesota, started the workshop series in the spring semester of 2018 through an athletic department initiative that has expanded this fall to include all students who are interested in learning more about the psychology of performance-related stress and strategies for addressing it. Her background in kinesiology with a focus in sport and exercise psychology aided in the development of the workshop series through student-professor collaboration. This unique opportunity for students to attend a free, on-campus workshop will take place on four different nights in Lund 207 at 7 p.m. The session on October 29 is the topics of Anxiety Management, November 5 is Visualization, November 12 is Confidence Building and Self-Talk, and November 19 is Motivation and Mental Toughness. The series is open to all students and attendance of all sessions is not required. This events are sponsored by the Student Athlete Advisory Committee (SAAC) and the Student Athlete Volunteer Educators (SAVE).